When it comes to providing cool-weather warmth, cozy fabrics are the first line of defense. Think chenille throws, cashmere blankets and flannel pillows. Offering welcome comfort, these fabrics add definitive style to your outdoor setting as well. To these you might consider adding heavy curtains to provide a layer of insulation and a delightfully nubby rug underfoot as well. Together, these items invite you to linger outside. Fireplaces, fire pits, heaters — the array of potential heat sources is wonderfully inviting. Always a cool weather treat, a fireplace ensconced along a wall offers both beauty and comfort. Likewise, fire pits, an increasingly popular choice, radiate heat to everyone seated around it. Meanwhile, space heaters have taken on new silhouettes, from electric lamp designs and wall-mounted models to propane heaters in tall, slender silhouettes. As afternoons quickly darken, lighting becomes essential to outdoor entertaining. Why not choose a combination of lovely candles and LED lighting? Now available in both soft and bright versions, LED lighting is the ideal accompaniment to candles, offering both ambient and task lighting. Providing protection from the elements, a permanent canopy or retractable awning over your deck enables you and your family or guests to enjoy being outdoors even in inclement weather. Imagine enjoying the snowfall while being warm and cozy outdoors! Of course, no entertainment is complete without delectable beverages. For cooler weather, consider creating a bar to serve hot apple cider, hot chocolate, assorted teas and coffees for the piece de resistance of outdoor entertaining in the fall and winter. 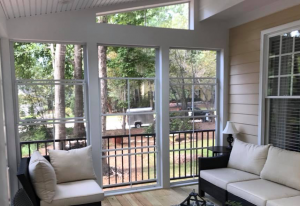 As cool weather arrives in southern Wake county, if you would like to enjoy these pleasures of a custom deck, let Holly Springs Builders design it for you. Just give us a call or text us at 919-346-0678 today.